Your child will be the most popular kid in school with a few of these delicious treats packed in his or her lunch. But be sure to save a few for yourself - adults love them too! Place oven rack just above oven center. Preheat oven to 375°F/190°C. Shape dough into 1-inch balls. Place balls 3 inches apart on ungreased cookie sheets. Gently flatten each ball with fork in a criss-cross pattern. Bake in the top half of preheated oven until lightly browned, 8 to 10 minutes. Remove cookies from sheets; cool on wire racks. It is an excellent tasting recipe! I never really bake cookies well last time i made them i mixed up cornmeal with flour but these directions helped me alot and i could make them and they were delicous i saved some for my mom on mothers day! the best cookies ever mmmm!!!!! These were good! I added more peanut butter to give them a real peanut butter taste! Thanks for a good base! Delicious! Thanks for such a great recipe! fabulous recipe, one of the best tasting I've found. Well it looks real simple to make. I made it for my sweetheart one night. He fell in love with me because of those cookies. Thanks Diana! The only cookie that I ever make anymore!!! Mix in cut up Reeces Mini's for an extra treat!! They were the best cookies I have ever had in my life! Thanks for setting up a website. You have the best cookie recipes. 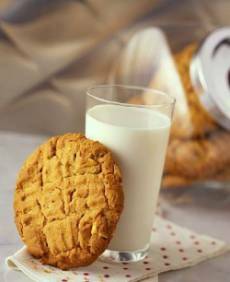 The recipe has the right combination of ingredients for a great tasting cookie. However being in warm & humid climate, its easier to work with the cookie by refrigerating the dough for at least 30 mins otherwise it is very sticky. Great recipe! Easy to make and delicous. My husband is a diabetic so I subtituted some brown sugar blend for the regular brown sugar. Didn't change the taste at all. I made it for my family and we all loved it and its all thanks to you diana, you have wonderful recipies. There is too much Butter in the cookies! I think that half the amount would be sufficient.